Pip, a YorkshireTerrier breed, sits during the 143rd Westminster Kennel Club Dog Show in New York, U.S., February 11, 2019. Dogs are probably the most popular pet in the United States. Although, many cat owners may not agree with that. On this week’s program, we hear a story about dog expressions. And to all of you cat lovers out there – we will have a show for you soon! Now, let’s hear Faith Lapidus talk about dogs in the English language. A Komondor relaxes during the second day of the Crufts Dog Show in Birmingham, Britain, March 8, 2019. People in the United States love their dogs and treat them well. They take their dogs for walks, let them play outside and give them good food and medical care. However, dogs without owners to care for them lead a different kind of life. The expression "to lead a dog's life" describes a person who has an unhappy existence. 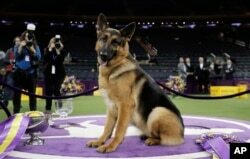 FILE - In this Feb. 15, 2017, file photo, Rumor, a German shepherd, poses for photos after winning Best in Show at the 141st Westminster Kennel Club Dog Show, in New York. 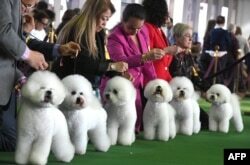 Bichons Frises gather in the judging ring during the Daytime Session in the Breed Judging across the Hound, Toy, Non-Sporting and Herding groups at the 143rd Annual Westminster Kennel Club Dog Show at Pier 92/94 in New York City on February 11, 2019. Husbands and wives use this doghouse term when they are angry at each other. For example, a woman might get angry at her husband for coming home late, or forgetting their wedding anniversary. She might tell him that he is "in the doghouse." She may not treat him nicely until he apologizes. However, the husband may decide that it is best to leave things alone and not create more problems. He might decide to "let sleeping dogs lie." Dog expressions also are used to describe the weather. The "dog days of summer" are the hottest days of the year. A rainstorm may cool the weather, but we do not want it to rain too hard -- we do not want it to" rain cats and dogs." And that brings us to the end of this Words and Their Stories. Until next time … I’m Anna Matteo. You ain’t never caught a rabbit and you ain't no friend of mine!